Hello Sledders! The entire trail system has been travelled now and we only have one area south of highway 43 by the Chickadee Burner that is blocked by some trees from a new cutblock. Millar crews will have it cleaned up soon. The rest of the trails have snow cover but water crossings and muskeg are still hazardous. Please use caution. Groomers will go out when the snow accumulates some more to build creek crossings. Golden Triangle Trail north to Letter O and northwest to Virginia Hills Road are cleared. The gate at the Eagle River Staging Area is open. Please ride with caution as many creeks along the trail are open. Some crossings are impassable. Remember to Buy Where You Ride! Get a trail pass! We have covered the entire south, west to V.Hills road, and north to the Carson Shelter. Only one small area near the Chickadee Burner that is impassable due to a new cutblock. We are working on that issue. North of the Carson Shelter (Golden Triangle Trail to Swan Hills) has not been covered yet. All trails have snow cover but creeks and muskeg are not frozen. Use extreme caution when riding. Thanks to all Trailblazers who helped out with the trail cleaning. Randy and Aaron would especially like to thank Fred for the chopper lifts! It’s here. The new groomer arrived in Whitecourt this week. Several Trailblazers were out cleaning the trails on Saturday and Sunday. A huge thank you to those who volunteered! The south trails are clear now and work will continue on the other areas this coming weekend. Trails are still very rough and creek crossings are hazardous. Use caution everywhere. Meet again at the Ritz for breakfast on Nov 17th and 18th. Bring sleds! 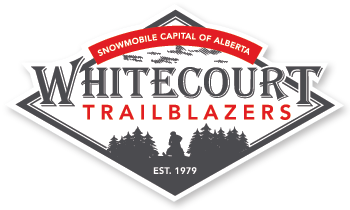 I know everyone is anxious to get on their sleds but the Trailblazers need to do the trail cleaning and make sure the trails and crossings are safe before opening. Trail cleaning begins tomorrow so come on out!! !Check here for updates.